If you need orthodontic care, you need to consider all your options. Getting a mouthful of pearly white, straight teeth is not easy and requires time and patience. One of the most popular options in orthodontic care is Invisalign. This orthodontic appliance works like braces, except without the brackets, wires and other brace features. Its main function is to straighten and enhance your smile. Getting the orthodontic device starts with taking an impression of your teeth. 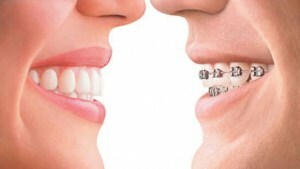 From there, a series of aligners will be fashioned; each designed to make subtle changes to the position of your teeth. Once the first set of aligners have been put in place, you will switch out one aligner for the next every two weeks or so depending on the recommendations of your orthodontist. The best way to look at the teeth aligner is a tool that is used to create a systematic modification in the position of your teeth. As your teeth systematically move in alignment, you will continue to visit your orthodontist to monitor the progress of the Invisalign aligners’ treatment. These checkups allow the Dr. McDermott to monitor your progress and make necessary adjustments to the next aligners that you will use to shift your teeth. Orthodontic treatment with Invisalign clear aligners can be customized to the patient’s mouth. Invisalign treatment can help correct overbites, under bites and other teeth alignment problems. There are two main differences between Invisalign aligners and braces. The first difference is that the former are removable while the latter are not. With Invisalign, you can still brush, floss and eat without having to deal with the wires and brackets present in traditional braces. You do not have to eliminate harder foods that may break off the brackets of traditional braces. In addition, the clear aligners allow you to maintain your dental care routine using your toothbrush and floss. Invisalign aligners are less complicated and more comfortable to put on. Invisalign are smoother than braces and the insides of your mouth do not have to rub or press into hard brackets. It is important to discuss all treatment options with your orthodontist to determine the most appropriate treatment for your needs. If you are interested in Invisalign, you should talk to Dr. McDermott to see if you are a candidate as they are not for everyone. Contact McDermott Orthodontics for additional information about Invisalign.